Recently, my buddy Tim was in a collision, which wrecked his Prius. He bought a replacement – same make, model and year, but it didn’t have any fuel economy modifications to it yet. So, Tim and I made a date to work on upgrading our vehicles. Primarily, it would be specifically to make the cars run better in the winter. 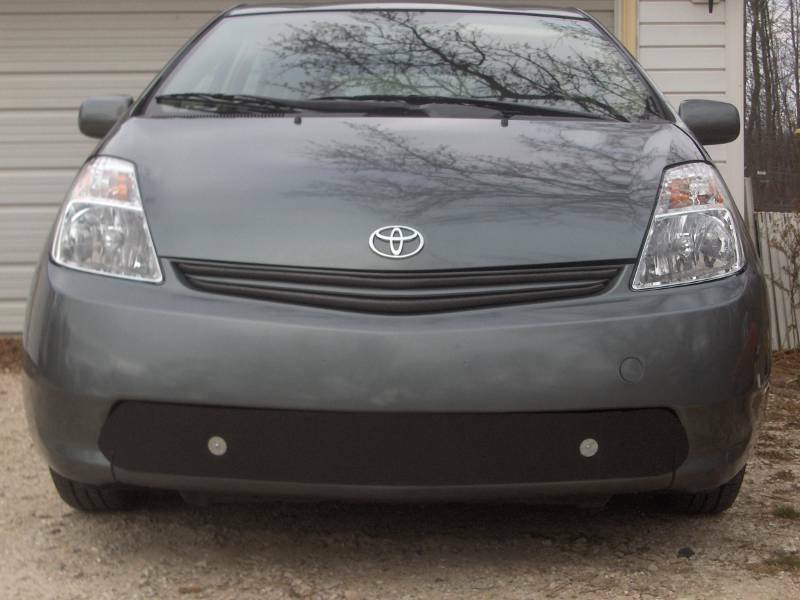 We started off with my wife’s Hymotion Prius. Although it has an aftermarket plug-in kit, it lacked the ability to truely drive as JUST electric. I got an “EV switch” that came with the car, but which was never installed. It’s a circuit board that you hack into the wiring harness. Once that’s done, pulling and holding the cruise control cancel puts the car into “EV Only Mode”. 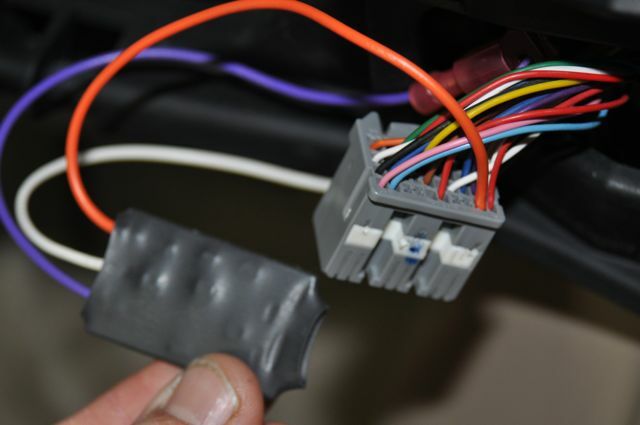 We pulled out the glove box and removed several pieces of trim around the area to access all the wire harness connections behind there. We crimped on two wires, and had insert a third directly into the plug. I managed to mess that up and snap the pin (and break it off inside there!) Fortunately, Tim was able to pull an empty pin from another wire harness connector and we eventually got it put together right! After that, we worked on the lower grill block. Tim had already built one for his black Prius, using several blocks of one-inch-thick wood that sandwich around the plastic grill. That gives a solid mounting point to screw some black coroplast to with fender washers. He brought with some more of the black corragated plastic. 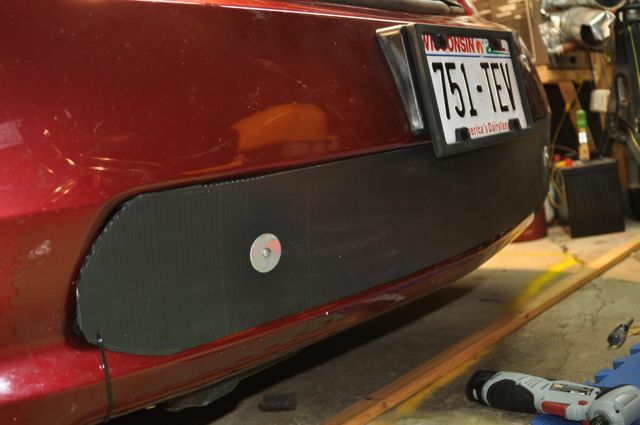 The four-foot width is almost perfect for the length of the lower grill. 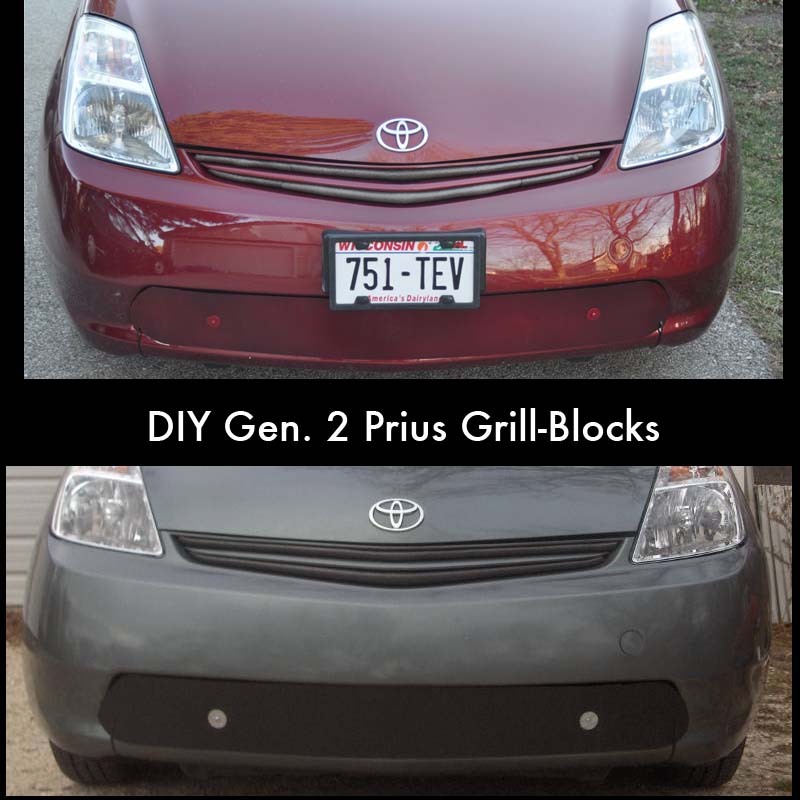 We cut a 6-inch width, covered the grill, and ran a pair of screws into the wood, the trimmed the ends to the shape of the grill. The far corners naturally stick out, but we found a way to make it look a bit nicer. We slid a zip-tie BETWEEN the fog light trim and the bumper, pulled the end through a hole in the belly pan, and then back around to hold the grill block corner in place. It wasn’t until the second end of the second car that I realized that we completely by chance managed to get the zip tie through a tiny hole in the fog light trim that holds it in place. Luck or not, it worked well. Once done with Kristin’s car, we brought Tim’s car into the garage, up on ramps, so we could work under it. And by “we” and mean that we crammed Tim under the car to reach his skinny arm up in there to install an OEM 400-watt block heater. There’s no way you can see where it goes. You just have to reach up in there and feel around for the blind hole in the engine block that takes the block heater. Tim put some of the heat-conductive grease in the engine block hole, (don’t put too much in!) and then slid the heater in place. After that, it was just a matter of fishing the power cord down from the top, and plugging it in. A few zip ties hold the cord in place in the engine compartment, away from the exhaust manifold and other hot components. For the grill-block, we simply TRACED the first one to make the second. Again, it was a pretty simple matter of screwing together pairs of wood blocks, and then screw the coroplast to it. For the UPPER grill-block, we used some of my ample supply of assorted foam pipe insulation to seal it up. We cut the insulation in half the long way, then folded that in half and stuffed it in the grill with the folded edge out. That way, it has a nice curved look to it, and the insulation holds itself tightly into the grill. It was a bit lumpy at first because of where there were vertical supports in the grill. We pulled back the foam, and cut a small slit in it wherever there was a support. Pushing it back in, the foam had a nice smooth and finished look to it. It was a good day getting all those heat-related modifications done. Tim even mentioned what a difference he noticed on the drive home. On the way out, his heater was really cooling off the engine. On the ride home (with the full grill-block) he was able to blast the heat the whole time with the engine staying at ideal temperature. This morning, I did a test run of the “EV MODE” on the Hymotion Prius. I went to the post office, bank, hardware store, auto parts store, and back home. A typical ten mile round trip errands run. I did the entire trip with the engine only coming on once when I accidently hit 34 MPH. I pulled over as soon as I could, and “rebooted” the car by turning it off and back on, and then pulling the cruise control cancel stalk for two seconds to reactivate the EV MODE. Finally, the car can be driven almost as a true EV! It’s still not quite a Volt. 100 battery amps and a 34 MPH top speed is fairly limiting. It means that it won’t work for big hills or country roads or freeway, but it sure is handy for in-town, or even something as simple as just moving the car in the driveway without powering up the engine! 🙂 ! How about you? 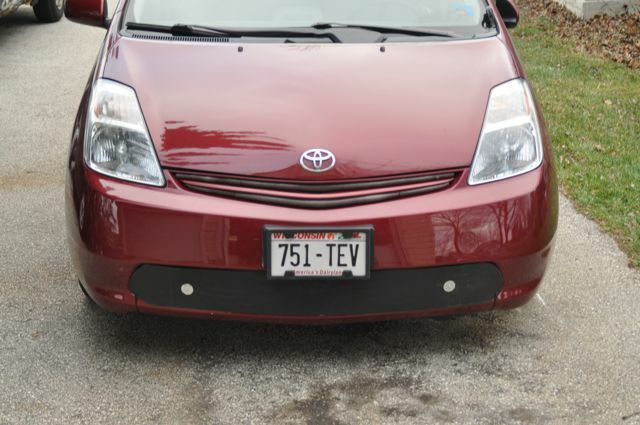 Do you have a favorite Prius mod? Especially one for the cold? Let me know! I know that he had to tinker with it quite a bit. Tim also mentioned that the particular kit has changed a number of times. Seems like the latest version of it keeps changing. Previous post: Things I know nothing about… Fiberglass!